When corals lose their color, it is known as "coral bleaching." Coral bleaching began receiving attention after it was first observed on coral reefs in the South Pacific in the 1990s. Coral bleaching also occurs in saltwater reef aquariums. The skeletal structure of hard corals are normally white, but they have color due to zooxanthellae algae. These tiny plants, which are a type of dinoflagellates (single-celled microscopic organisms which belong to the Protista kingdom), reside within the soft tissues of corals. These microalgae are photosynthetic, and they have an endosymbiotic relationship with some corals, as well as other marine life such as Tridacnid clams, nudibranchs, some sponges, and even jellyfish. Symbiosis refers to two dissimilar organisms living together in a mutually beneficial relationship. During the day, the zooxanthellae photosynthesize. The coral polyps benefit from the photosynthate (product of photosynthesis) and in turn, the algae benefit from the nitrogen, phosphorous, and carbon dioxide waste produced, which it needs to grow. By night, the polyps feed on plankton by capturing it with their tentacles. If the rate of photosynthetic production is too high, corals have the ability to control the number of zooxanthellae in their tissues by expelling it. 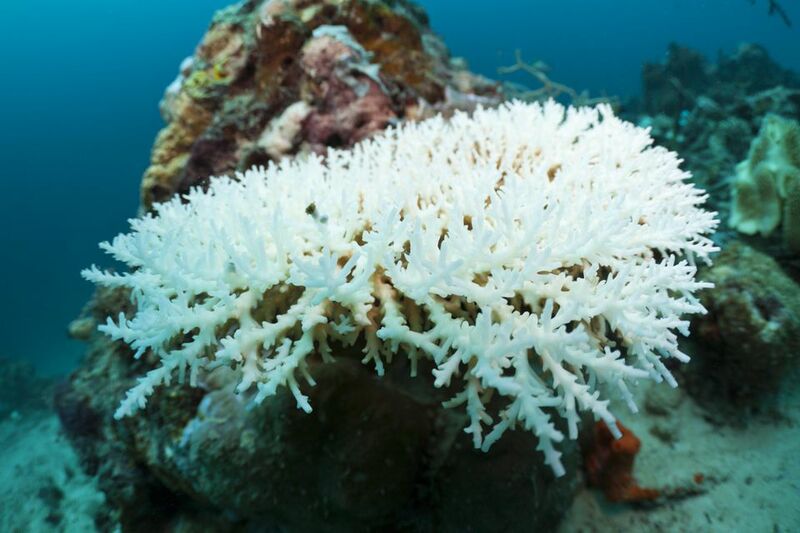 This is known as coral bleaching, which is normal. However, when corals are immoderately stressed, this causes them to expel more zooxanthellae than necessary, and therefore lose of color results from the expulsion of too many zooxanthellae, and/or the concentration of photosynthetic pigments in these organisms are diminished. Although long-term bleaching can cause the partial or total death of coral colonies, if the situation is not too severe and stressful conditions are changed, it is possible for affected colonies to recover their symbiotic microalgae and start growing again. Since stress seems to be the key to this problem occurring, let's evaluate what events are reported to be the cause of bleaching on coral reefs around the world. The effects of El Niño and La Niña events are thought to be sources of coral bleaching. Global warming, meaning "climate changes" to the earth's atmosphere due to greenhouse gas emissions, is said to correlate with increased hurricane, tornado, flood, sand and other storm activity, sea levels rising, and so on. Climate changes could be causing stress to coral reefs. How Does It Impact Marine Ecosystems? A change in ocean currents, which relates to changes in phytoplankton and zooplankton populations, as well the number of other nutrients present in the water. A build-up of carbon dioxide and methane gasses. Exposure to increased ultraviolet radiation. Exposure to high light levels. Increased or high water turbulence. Sedimentation, which relates to a decrease in light levels, as well as suffocation of sessile marine life. Pollution, which is not limited to the depositing of sediment from soil erosion, chemicals such as nitrite, nitrate, ammonia, phosphate, as well as other detrimental contaminants into the sea via river run-off and drain pipes. Do any of these conditions sound familiar? They should. These are standard stress producing factors one has to watch for when keeping a saltwater aquarium or reef tank. If you are having trouble with corals bleaching out or losing their color, even though you feel you have been providing them with a quality environment and proper care, you should evaluate and take the above points into consideration as plausible causes. It is possible that a bacterial infection may be the culprit or a contributing factor as well. Who Do You Troubleshoot Saltwater Fish Diseases?